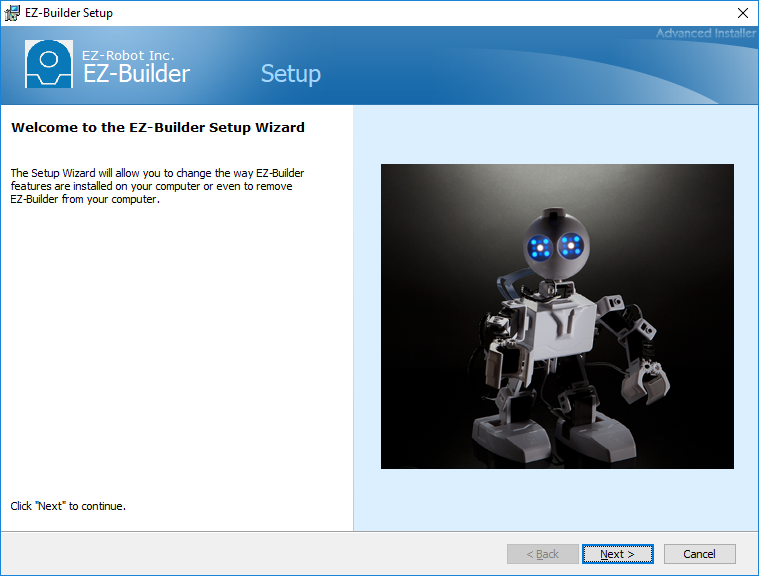 ​This page will detail how to install and setup EZ-Builder on your PC or tablet/phone. It will cover everything you need to get started with EZ-Robots. The ‘Start Here’ guide that is included in every box is also an extremely useful tool. 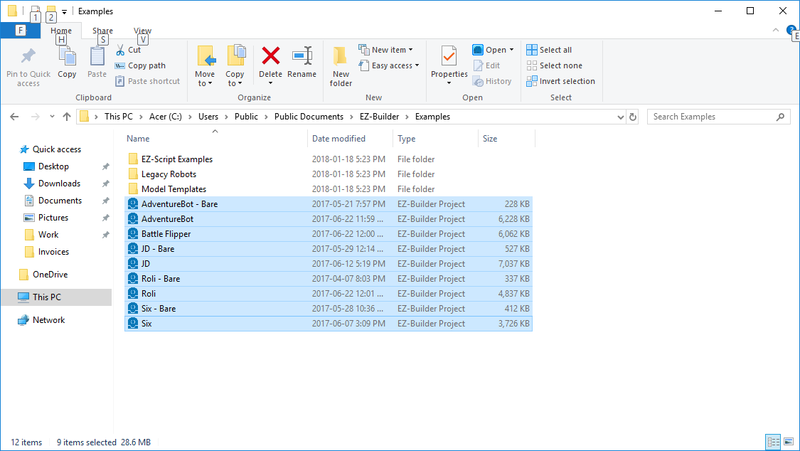 Please note that EZ-Builder currently only works on Windows (not Macs or Chromebooks). ​Go to www.ez-robot.com/EZ-Builder to download the latest installment. ​This prompt or a similar one like it may pop up. Click on “Run”. If a security prompt shows up, click on “Yes”. Your computer may ask to install necessary C++ or C# .net structure code. This is normal, and you should allow it to happen, as often the software will automatically go and find the necessary files. If you have any issues, please contact zacc@robots.education. 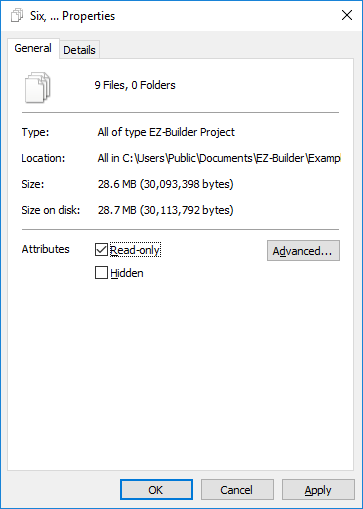 Now you have properly installed EZ-Builder. However, there are a few more things to do before we can be fully set up. When you first open EZ-Builder, you will get a popup with some information and arrows to continue. Read through these pages, click on the arrows to go to the next page. At the end, check off the Agree to Terms and Conditions checkbox and click OK.
You create your own EZ-Robot account. This allows you to have your own EZ-Cloud and restrict anyone from accessing your projects that are not labelled as public. This gives you the most flexibility. You can create a general account that everyone can use. This allows projects to be shared between students, which may be a positive or a negative. A potential problem is that students may end up deleting other student’s projects, as they all have access to every project stored on the cloud. For either one, first you must go to the “Options” tab, and then click on the button “Account Settings”. ​At this point, you can choose whether to make a general account, or to create individual ones. If you created an account and logged in correctly, it should give you this popup. ​​Above is the EZ-Builder home page that you should see. ​You may get a pop-up that looks like the one above. 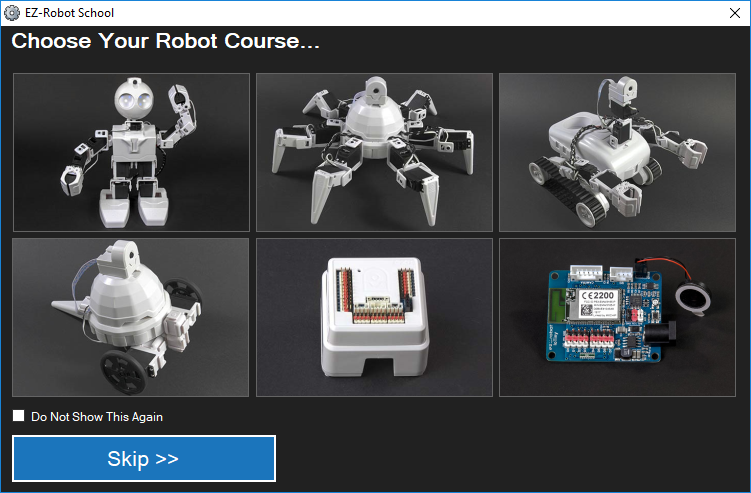 Clicking on one of the images takes you to the EZ-Robot website tutorial section. In there you can find a multitude of tutorials for everything the robot can do. 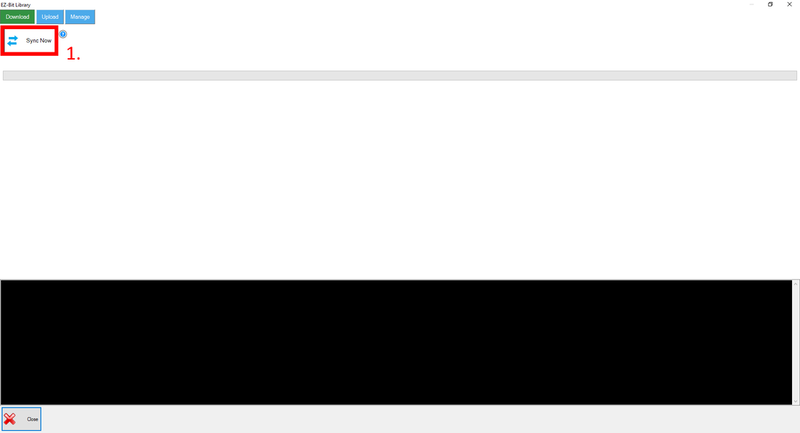 This is useful later if you have problems, but for now, you can click “Skip”. ​Now that we have logged in, we need to sync the bit library. At the top left, click on the “Project” tab, then the button that is labelled “Library”. ​In the new window that pops up, click “Sync Now”. Allow it to sync. Wait for the process to complete, then click “Close” at the bottom left. ​As sometimes projects can become corrupted or lost, it is important to set the example project files to ‘read-only’. This means that they cannot be overwritten, and you will always have a project that can operate the robot ready to go. You will need to do this if you ever update EZ-Builder as well. 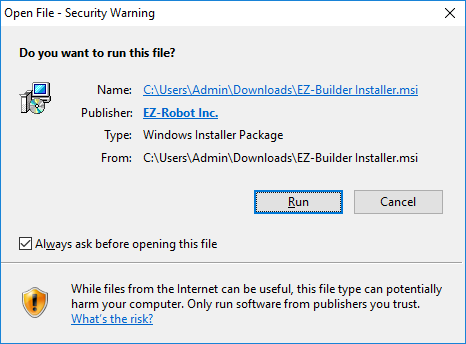 If you installed the EZ-Builder in the default place, follow the instructions below. 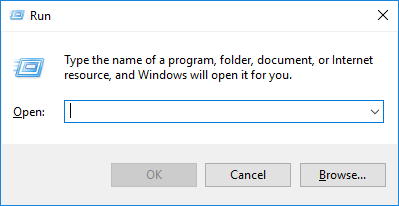 Open the Start Menu, type in “Run”, and hit Enter. ​Then highlight all of the projects as shown above by clicking and dragging. Right click on one of the projects and select “Properties”. ​ In the Attributes section, check off the box labelled “Read-Only” and click “Apply”. ​Now the example project files cannot be overwritten. First, go to either the App Store for Apple devices, or the Google Play store for Android devices. 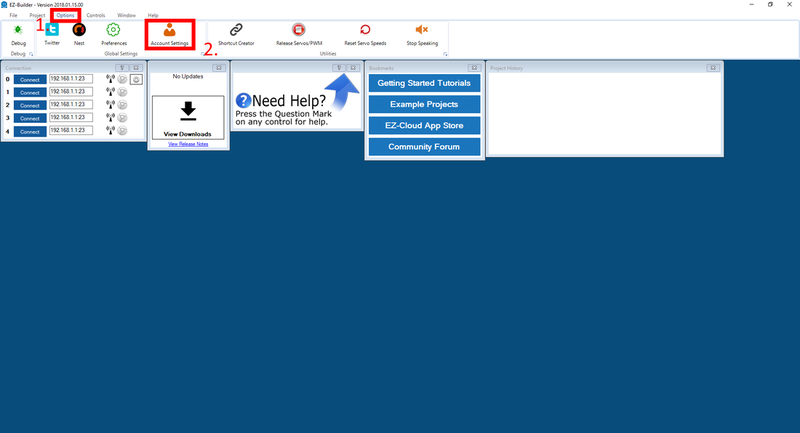 Search for EZ-Builder; download and install it. Once the download is complete, open the app. You will get a screen of terms and conditions. Scroll down and agree to them. First, make sure you are connected to a local WiFI network. Go into Preferences and log in to your EZ-Robot account. If you do not have an account, you will need to create one to continue. Once you have entered your email and password, tap on Save. You should get a popup with Success if you have done this correctly. Now, you need to download and install the project for your robot. Go to Public EZ-Cloud Apps. Wait until the menu settings load, then tap Search. Find your robot, and tap on Details beside it. At the top right, tap on Download and Install. You are now ready to use the Mobile Version. 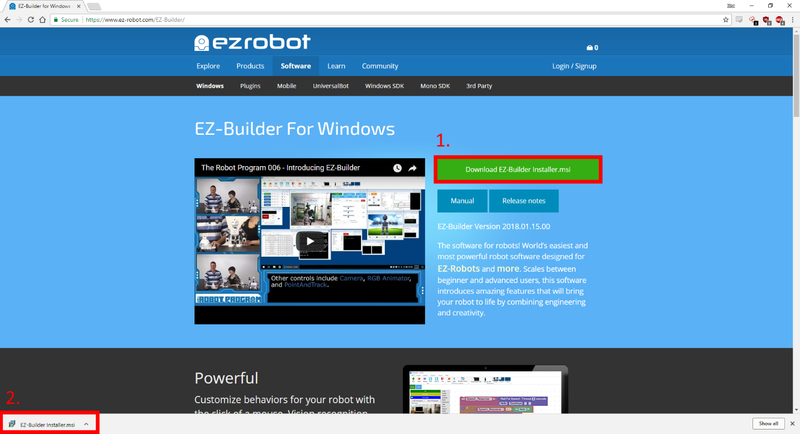 ​If you have any problems with setting up EZ-Builder, or if there are any issues with this guide, please contact zac@robots.education for more assistance.